America has a drug problem that goes well beyond opiates and abuse. Pharmaceutical drug prices have skyrocketed in the last decade and fueled an overall increase in health care costs and spending. The top ten most prescribed medications have all risen more than 50% since 2011, with four out of ten having doubled in cost. Unfortunately for American families these increases in prescription costs have significantly outpaced inflation and wage increases. The inelastic nature of prescription medications drives pharmaceutical spending because individuals have little choice in purchasing and taking their medication if they would like to survive or manage their condition. This is particularly troubling, as the epidemiological transition has moved the disease burden away from infectious diseases and towards chronic conditions. Chronic diseases are now the leading cause of death in America with almost half of the nation having at least one chronic condition– a number that is projected to rise through 2030. Chronic conditions impose a significant economic burden on the U.S. healthcare system because patients have to afford their treatment for the rest of their lives. While the rise in chronic conditions itself is problematic, the exorbitant pharmaceutical prices used to treat these conditions is one of the foremost issues facing healthcare today. Perhaps the most troubling fact regarding out-of-control prescription drug costs is that the most vulnerable members of American society are adversely impacted. Individuals unable to afford insurance are left to pay for expensive pharmaceutical treatments out-of-pocket, while those who have basic insurance face tremendous copayments in order to receive their medication. Medication costs are a major factor in driving cyclical poverty as Americans struggle to afford the prescriptions that they need in order to survive. Without reproof, there is a need to drive down the cost of prescription medications in the United States; however, the exact method of doing so remains unclear, and any steps to formulate a solution results in a highly contentious argument. While 87% of Americans are in favor of repealing legislation that bars Medicare from negotiating prescription Part D drug prices, studies from Yale Law School state that, “rarely have we seen a health policy issue on which there is so much apparent consensus that is backed by so little research”. Allowing Medicare to negotiate their own Part D prescription drug prices would decrease prescription choices for Medicare beneficiaries and could shrink the list of covered medications by 30%. Furthermore, allowing Medicare to negotiate prices could stifle pharmaceutical innovation and hinder progress in the pharmaceutical industry. Research and development of medication are costly and without the proper financial compensation pharmaceutical companies would shift their focus away from creating drugs for the Medicare Part D population. As is often the case with increased government intervention, the unintended consequences that result are more detrimental than the policy that they aim to fix. Unfortunately, if Medicare is allowed to negotiate their own prices for Part D prescriptions the Medicare population could wind up with fewer choices in medication, fewer new medications and similar costs. The ideal solution to controlling prescription drug costs then must both drive down prices for consumers while bolstering innovation in the pharmaceutical industry. While these two objectives seem mutually exclusive, it turns out that they might not be. Value-based pricing (VBP) for pharmaceuticals can help to both alleviate costs and incentivize pharmaceutical advancements. According to Dr. Utpal Dholakia, a business professor at Rice University, “Value-based pricing is the method of setting a price by which a company calculates and tries to earn the differentiated worth of its product for a particular customer segment when compared to its competitor”. 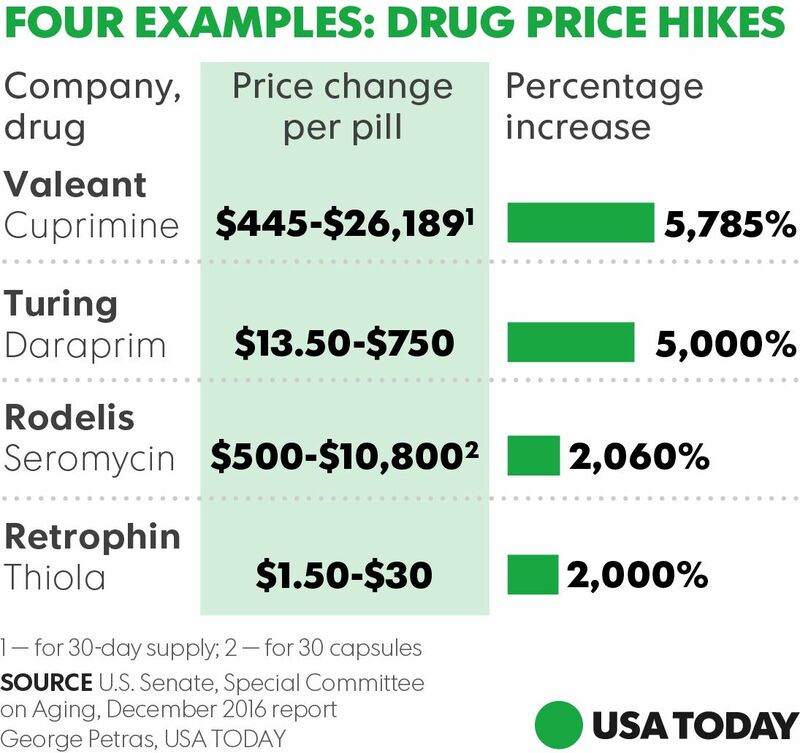 Value-based pricing would eliminate egregious price hikes that became synonymous with the pharmaceutical industry, thanks in large part to Mylan’s Epi Pen scandal (and others shown in the graphic below), by mandating that the prices for prescription drugs be directly linked to their efficacy. In this outcome-based version of VBP, American’s will pay a more objectively fair price for the medications that they receive and would be given a rebate for prescriptions that do not work for them. Under this model pharmaceutical companies are still incentivized to push forward with innovation as their profits are directly linked to the quality of their products. Given the expected upside of value-based pricing, why have the Centers for Medicare and Medicaid Services (CMS) not adopted its implementation? The primary barrier is Medicaid’s “best price” legislation that mandates Medicaid receive the lowest price on a unit basis of prescription drugs. Rebates issued to specific patients for whom the medications are not effective under VBP would then mandate that all Medicaid beneficiaries receive the rebated price, regardless of whether or not they benefit from the pharmaceutical. This means massive quarterly profit losses for pharmaceutical companies, depending on the size of the rebate. This is a prime example of the aforementioned unintended consequences that arise from government intervention in the market. The key to making value-based pricing work lies in the hands of CMS. Changing the unit basis definition for Medicaid’s “best price” legislation would allow pharmaceutical companies to set prices based on a medication’s performance across a patient population rather than an individual person. For example, if a pharmaceutical company offers a 60% rebate to an individual for a drug that initially costs $80 then the new lowest price is $32. However, if the drug is 95% effective in a patient population of 5,000 overall then the lowest price is still greater than $70 and would not enact Medicaid’s “best price” rule because this number is higher than the 25% rebate that they automatically receive from the manufacturer. CMS has the ability, and should, restructure the wording of the “best price” rule to reflect the success of pharmaceuticals in the population overall. With these changes VBP, and specifically outcome-based pricing, can ease financial costs to patients while also allowing pharmaceutical companies to make sustainable profits that encourage innovation. America is at an important juncture in pharmaceutical pricing. Current prices are unsustainable as price-hikes for prescription drugs outpace inflation and wage increases and leave the most vulnerable members of American society adversely affected by high costs resulting from a broken pharmaceutical pricing system. Because of the epidemiologic transition and the onset of chronic conditions more Americans are taking prescriptions than ever before. Rather than going for low-hanging fruit (allowing Medicare to negotiate Part D prices) that would eventually decrease prescription options for Americans and stifle pharmaceutical advancements, CMS should fully implement value-based pricing and fine-tune their unit basis definition in Medicaid’s “best price” legislation. Doing so would thwart future efforts at pharmaceutical price-hikes, drive down the overall cost of prescription medication and incentivize pharmaceutical quality and innovation. Too many Americans rely on medicine for survival and livelihood to simply let this issue continue to spiral out of hand. The time for value-based pricing is now! Wu S, Green A. 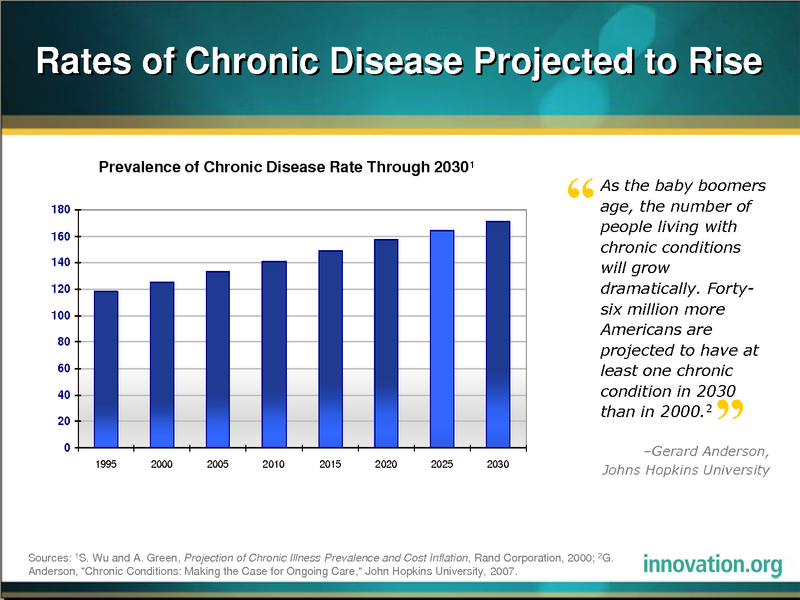 Projection of Chronic Illness Prevalence and Cost Inflation. RAND Corporation, October 2000. Tags: Chronic care, Chronic conditions, CMS, EpiPen, Medication, Pharmaceuticals, prescriptions, Rising costs, Value-Based Pricing, VBP. Bookmark the permalink. Previous post ← Three Mile Island Shutdown: A Major Setback for our Clean Energy Future.